Background: Tianeptine is an atypical antidepressant marketed as Stablon since the late 1980's. While chemically very similar to tricyclic antidepressants, tianeptine was thought to have the apparently paradoxical mechanism of action of enhancing serotonin reuptake. 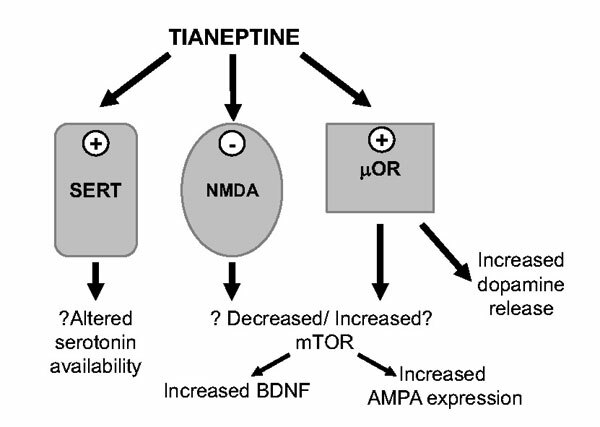 However, recent data highlight a multimodal pharmacology for tianeptine including actions at glutamatergic synapses (inhibiting NMDA receptors and an indirect effect on AMPA receptors) coupled with agonist effects at mu opioid receptors (µ-receptors). Objective: We have reviewed clinical and preclinical data for tianeptine to provide a comprehensive study of its pharmacology. Results: Clinical trials show that tianeptine is at least as efficacious as first-line antidepressant treatments, with improved tolerability as it is significantly less prone to disrupting the patient's normal functionality. Tianeptine appears more efficacious in males than females, although these gender-specific differences may be accounted for by pharmacokinetics. Preclinical data suggest that the ability to stabilise glutamatergic neurotransmission may underlie tianeptine's ability to improve cognitive function and anxiety-related symptoms. Alternatively, µ-receptor activation of the mTOR signalling pathway could lead tianeptine to be a fastacting antidepressant. Agonist actions at µ-receptors could also explain the potential abuse liability and dependence issues seen with high dose tianeptine. Conclusion: Tianeptine itself is off patent, but it still holds much promise as an experimental tool yielding valuable insights into the molecular mechanisms underlying depression. Depression, anxiety, serotonin, glutamate, µ-opioid receptor, gender, mTOR.